Everyone ready for another round of Secret Recipe Club? I am! Members of the Secret Recipe Club are assigned a blog each month. Who has who is a secret until reveal day (today!). The mission is to choose a recipe from the assigned blog, make it, and share it! This month, I was super excited that I was assigned a blog I’ve been following for a while now! I am a Honey Bee is a mostly-food blog by Nicole, who is a New England native like me and currently lives in Massachusetts (so reading her blog brings some great nostalgia). Nicole has an adorable pup and is currently expecting her first baby! She makes TONS of delicious recipes and I’ve loved following her over the last year or so. I really wanted to try Nicole’s Tropical Pork Pineapple Kebabs, but in the end, as always, dessert won me over. 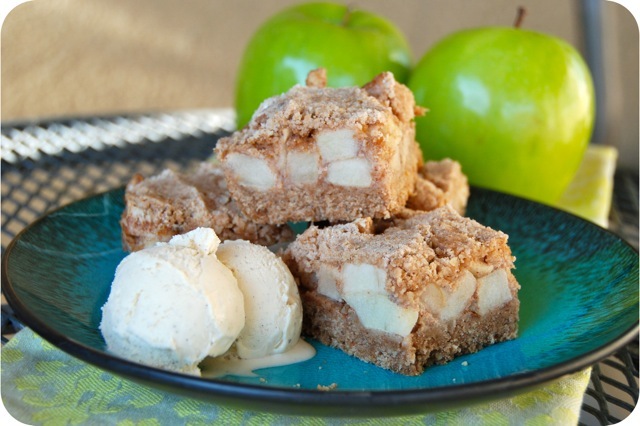 It’s totally not the right time of year, but Apple Pie Squares were seriously calling out to me. 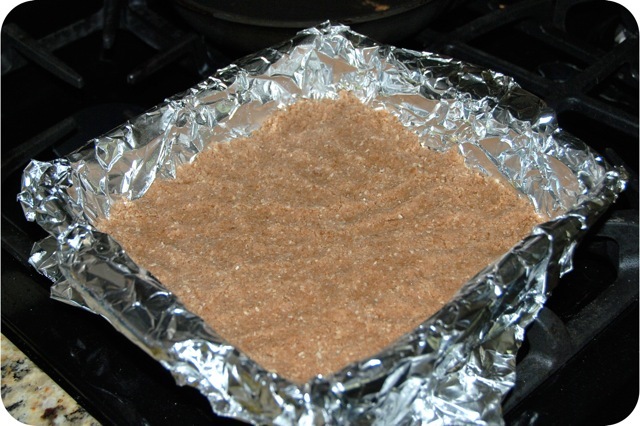 Preheat oven to 350 degrees and prepare an 8×8 pan by lining with foil or parchment. In a large bowl, mix the apples with the sugar, flour, and cinnamon. Once evenly coated, add the yogurt and mix to coat all pieces. Set aside. In a food processor, blend the oats to a fine meal. Add flour, brown sugar, salt, baking powder, and cinnamon, and pulse to combine. Add the butter and pulse until the dough is crumbly. Remove 1 cup of the mix, set aside. Add egg white, and pulse until mixture is just combined. Spoon filling evenly over the crust. Sprinkle reserved topping mixture over apples. Press down to flatten just slightly. Bake at 350 degrees for 30 minutes or until top is golden brown. Yum this sounds delicious! Love the yoghurt in the filling. Great pick for SRC! Oh those look absolutely FANTASTIC – what a great selection!! I love apples and have way too many in my fridge right now. Going to have to try this recipe, it looks amazing! Yum…I have a similar recipe and they are so yummy!!!! Great choice. Great recipe pick! I had her blog last month, and yours this month! 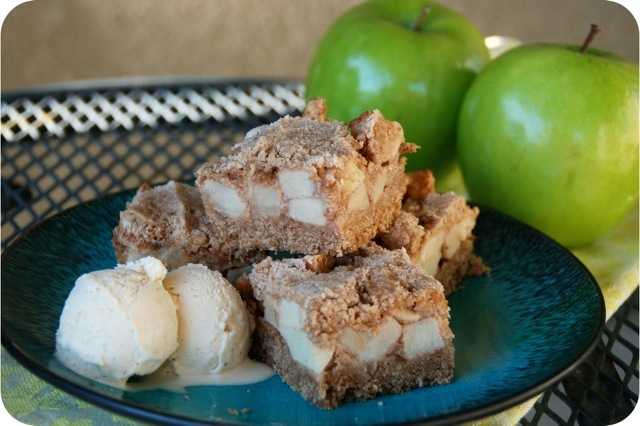 I can eat apple desserts all year long! Great SRC pick! That’s perfect for upcoming fall – it’s already cooling down where I live, so I’m saying goodbye to summer LOL. Hello there yumminess!!! 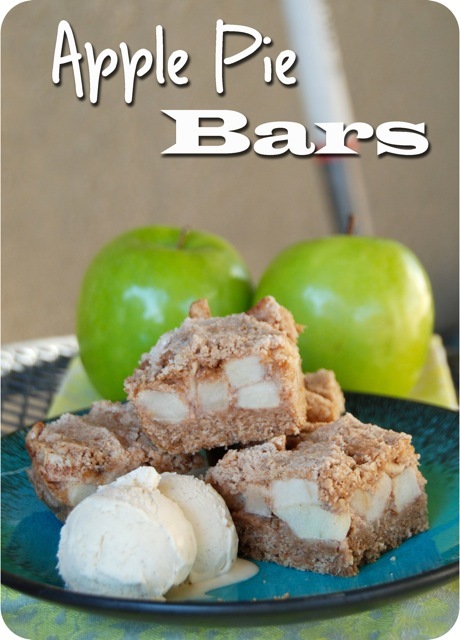 I will be definitely be making these bars this Fall when apples are coming out of my ears with abundance! 🙂 Fabulous SRC pick!! I love apple anything and will have to save this for when we go apple picking in September. Great SRC pick! I don’t think I can wait until fall to make these–they look totally yummy! WOW those look good! They would have won me over too! Great SRC pick! They have me craving fall right now! I totally need to make them again. These look amazing, and perfect for the upcoming Fall apple season. Oh, I bet they would be great with peaches too.